On Wednesday night I had a panic attack. Wait, don’t click another tab. I know, food bloggers are supposed to drift round in a content haze of aspirational recipes, instagrammed photos of coffee and noodles, and bacon cupcake-flavoured macaron whoopie pies. Yet here I am. I was going to sort of pass it off with an “enough of that, here’s the food” kind of segue since this may not be what you want to read, but since the only criteria I keep for this blog is, did I cook it and/or did it happen to me...I’m talking about it. I’m no stranger to panic attacks but it has been a while, and just in case anyone else had had a similar experience recently I share mine, in the spirit of you-are-not-alone-ness, of not-being-ashamed-ness, and other such forcibly portmanteau-ed words. So. I went from standing there aimlessly to sweating, heart thumping, knees buckling, having to support myself by leaning on a wall, weird thoughts flying round my brain, a massive sense of unease, gulping for shallow breath. It went for about five minutes. And then it just subsided, and all I was left with were shaking hands and confusion. The thing I found weird was that nothing in particular had happened that day. On the other hand, I tend towards being highly anxious pretty easily, and have had some fairly clenched-knuckled moments over the last year – possibly this was a reaction to a long build up of tension. It’s not ideal, and life would doubtless be much easier if I was more happy-go-lucky, but I’m not, and at least I know that…right? You know what helps panic attacks? I don’t know, and pulled pork isn’t the answer, but it is what I was making when it happened. 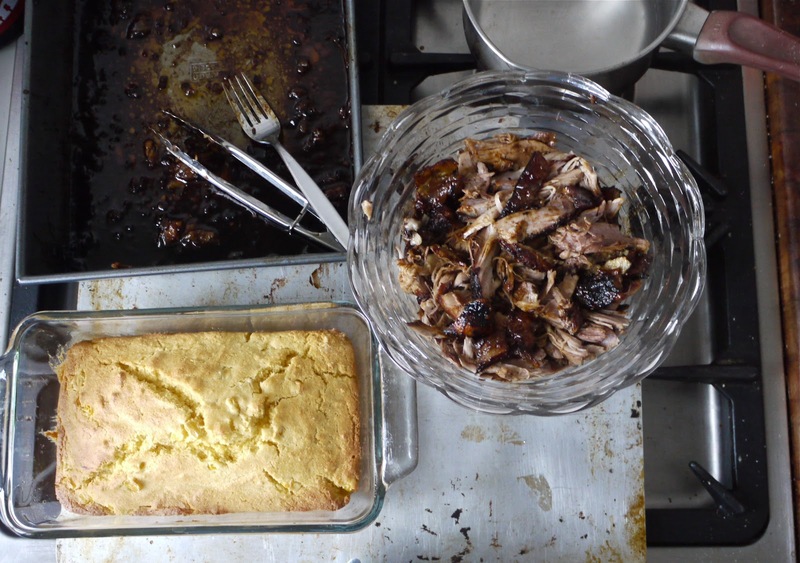 And the thing with making pulled pork is that it just sits there for hours and hours, but bully for me, the attack came on just at the point where it was in the middle of the basting/resting/pulling/making accompanying cornbread stage. If nothing else, it was good to have something to focus on, but my hands continued to shake for at least an hour after the attack, which is not so condusive to taking elegant blogworthy photos of my dinner. Earlier that week I’d spied some belly-cut pork shoulder that was both free range and on special, and without having ever considered making pulled pork before, suddenly it was on my mind. Pulled Pork is a classic American treatment for a side of pig, and generally one that requires a smoker or barbeque. Neither of which I have. There seemed to be so many differing methods, that I decided to gather knowledge from everywhere and make something that works for me. I’d like to lend particular gratitude however to Michelle at Thursday Night Smackdown whose recipe was the only one who advised me to sit the pork fat side up, and had the simplest method to emulate. One does not simply walk into Pulled Pork. Although…I kind of did. At 10am I decided I wanted to make it, at 6pm we were eating it. That is not, I emphasise, a very long time for it to be in the oven. And, I didn’t marinate the pork for 12 hours in the way that every recipe recommended, either. This is a highly important step to audaciously leave out, but it was still the nicest thing I’ve ever eaten. My theory was that it’s in the oven for such a long time, on such a low heat, that the spices just marinate it as it goes along. It’s not right, but it’s okay. That is, it’s not deeply authentic, but it’s inauthentic with the greatest respect. With thanks to Thursday Night Smackdown’s recipe for guidance. 2 kg or more – basically a goodly slab – of belly cut pork shoulder. Or just pork belly. Set your oven to low – around 140 C/ 300 F. Put your pork in a decent sized roasting dish. Mix together all the rub ingredients and rub into the surface of the pork, all over, leaving it fat-side-up and sprinkling over any leftover rub. Place in the oven and leave there for several hours – at least four. At this point, mix together the mop ingredients and pour 1/2 a cup of it over the pork every hour till it’s gone, then continue to cook for about another 1/2 hour after that to help the fat crisp up some. Finally, remove it from the oven, cover with tinfoil and leave to sit for an hour to rest and cool slightly, before shredding the heck out of it with two forks. 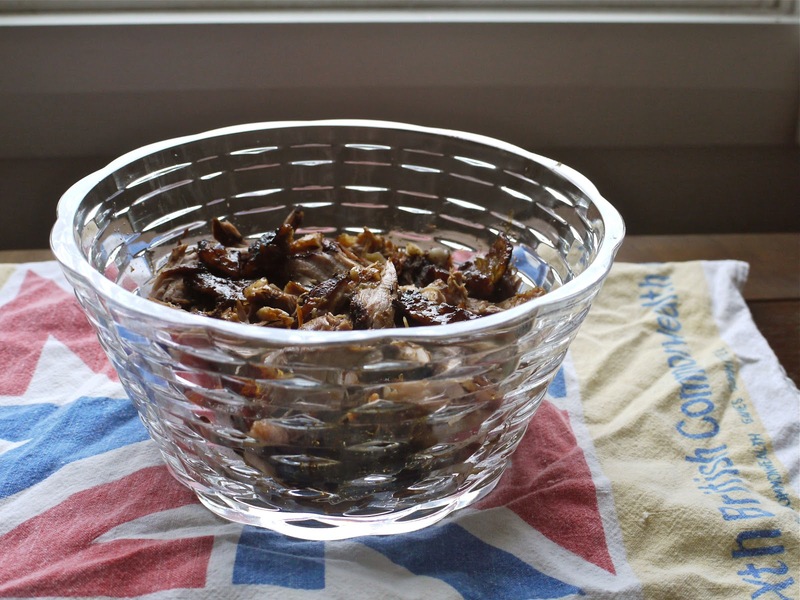 Bust up any bits of crackling that have formed and add them to the pulled pork too, and should you still have any porky-mop-spicy liquid in the bottom of the roasting dish, tip that in too. Ey, why not? If you’re wondering what could motivate you to funnel that much of your time into a briquette of meat, the answer is pure, headrushy deliciousness. The pork basically melts down gradually over time till it falls apart unexpectedly when prodded (like me! This pork is both allegorical and delicious!) The spices, warm cinnamon and ginger and so on, and the sticky dirty coffee-cola mix just imbue the meat with mysterious savoury-sweetness, or umami if you will, laquering the fat as it crisps up and soaking the fibres with dark smoky flavour. 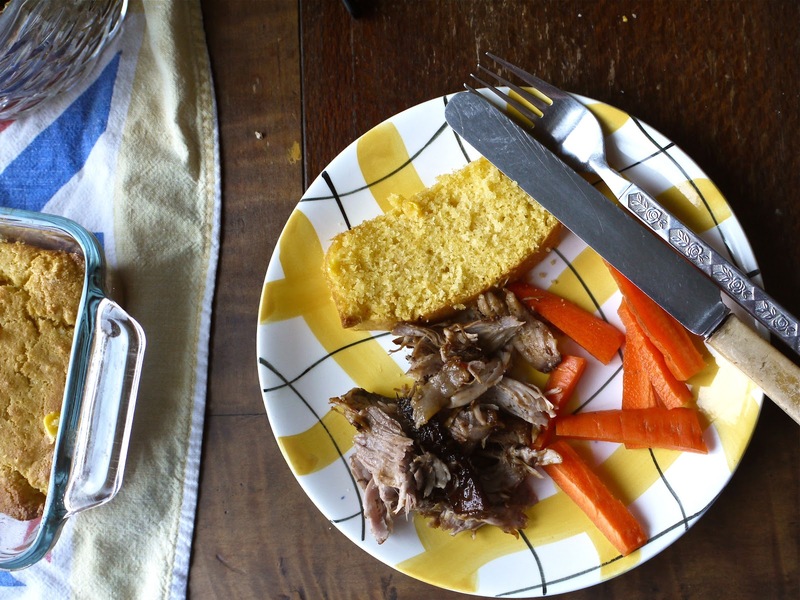 I served it with this cornbread, which I’ve made roughly a squillion times, only this go around, as if it knew how much I needed it, the same old recipe produced the most beautiful, soft, tender cornbread of my life. Thanks, cornbread. 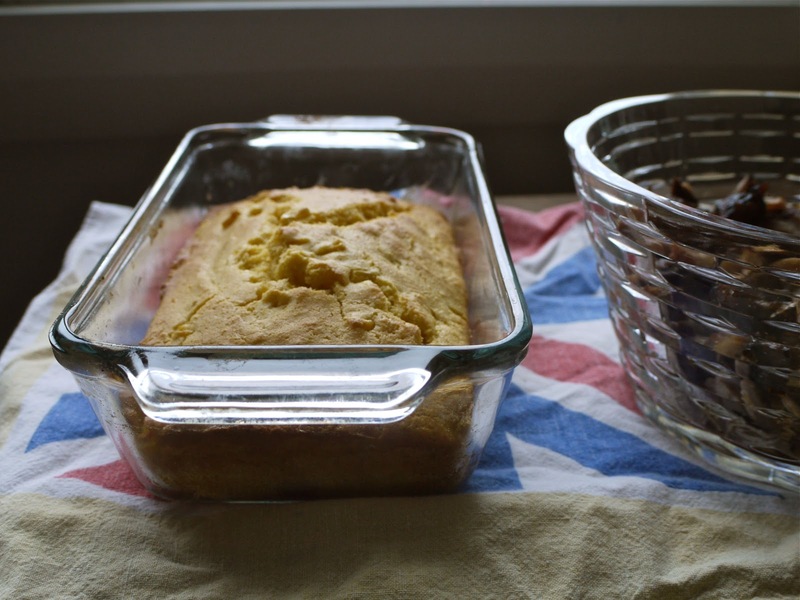 And thanks, not just to cornbread, but to anyone who did keep reading. Panic attacks aren’t the very worst thing in the world, but they’re also not the greatest – that is, I’m not seeking out Elizabeth Wakefield-type shoulder squeezes here, but I’m not trying to brush it off as nothing – it just is what it is. Title via: Company, one of my favourite musicals ever, and its mid-point showstopper Side By Side By Side. Grimes, Oblivion. Really pretty obsess-over-able. Chic Gamine, Closer. I’m not a fan of their actual name but I’m such a sucker for growly vocal riffs and harmonies like these. Sorry to read this bad experience…I've never had a panic attack but I just guess how it makes you feel as in certain situation I'm claustophobic…maybe something is similar. The attacks do sound awful…but I can't think of a better cure than pulled pork! I went to college in the southern US and if there's anything I fell in love with down there, it's that…haha. So nice to know I can try recreating it at home! Eastern NC bbq is very vinegary, I wonder how the yummy coke sauce would taste with some acidity added. I'd heard it was good in a slow cooker but I really wanted to make it in the oven – I suspected our slow cooker wouldn't provide any crackling. Do it! And then it can be a thing! Thanks, Sally – but really, thank you, because you reminded me that I forgot to write vinegar in the ingredients list! hi love that pork looks right up my alley, hope you are ok, i had a panic attack last year, first one, we were out for dinner for the first time in a year and i ruined it by going into meltdown, wallpaper was moving, smells got really strong, jay had to eat two entrees then we made a dash home…. it was crappy …. 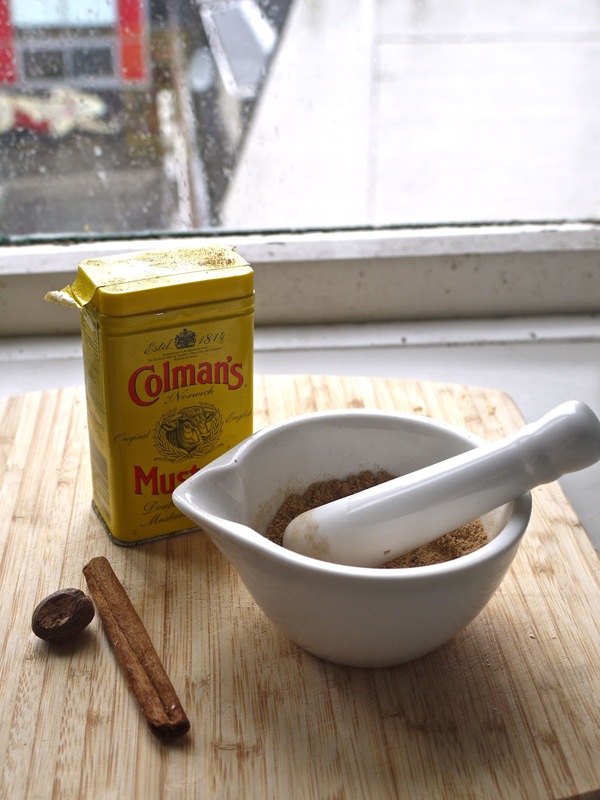 Mortar and pestles do indeed make me feel like I know what I'm doing too. Also it's probably more socially acceptable to take your anger out on some spices hehe. Sheesh you poor thing! I have no idea what panic attacks feel like, but I do know exactly what it's like to 'tend towards being highly anxious pretty easily'. Having a housewarming party here on the 21st, and had been contemplating a roast/sandwichy type of supper to serve to our guests about 10ish to mop up some of the alcohol. I think this just might be the ticket. I love TNSD too! Hehehe, we're in Masterton, wanna come? Guests will include astronomers, zumba instructors, midwives, printers and teenagers (kids allowed to invite a couple of their friends)….food bloggers would appear to be an under represented group! I'm sorry to hear about the panic attack, I used to get them and they can be truly debilitating. Ah, to be the laid-back type. Hopefully we highly-strung people can get there someday. Love how you compared yourself to the pork though! Its my birthday next week too! 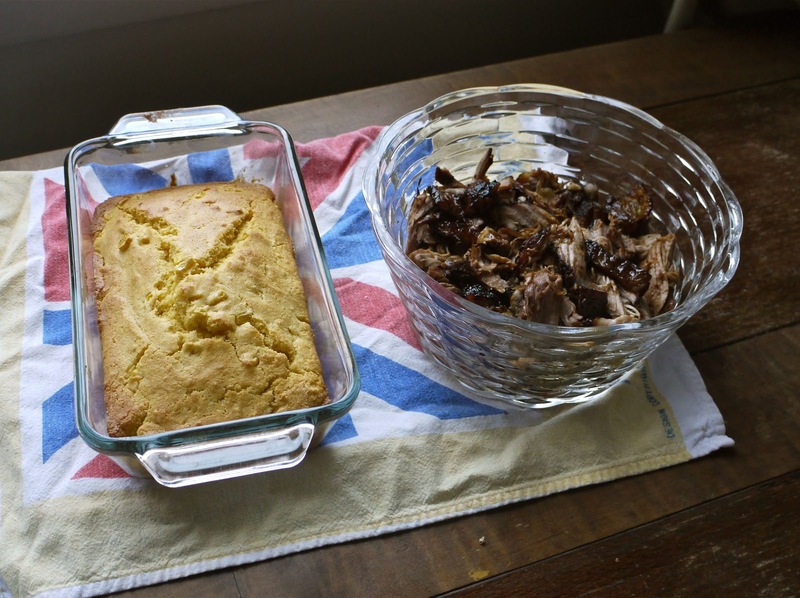 I may demand pulled pork and cornbread be my celebration dinner it looks so delicious!! If you give me that British Commonwealth tea towel I will make you a beautiful apron out of it. Happy Birthday! So sorry about your panic attacks, Laura – that's not fun at all – but this deliciousness sounds like the perfect “cure-all” for just about anything. I made a version of Mark Bitman's Cinnamon Pork Shoulder in the slow cooker a couple of years ago, but I'm loving the sound of this more – I totally need to try this. I have this in the oven, planning on having it for dinner tomorrow night, stuffed into wodges of baguette(will shred it tomorrow and reheat in slow cooker). Smells all kinds of awesome! Is there supposed to be mustard powder in the rub? Hi Laura, that sounds absolutely delicious! Will be giving it a go for sure. I get panic attacks too, no fun at all.